These long tendrils grown by Shewanella bacteria are built to conduct electricity like a wire rather than sense surfaces like a hair. Image courtesy of University of Southern California. Enlarge Image. 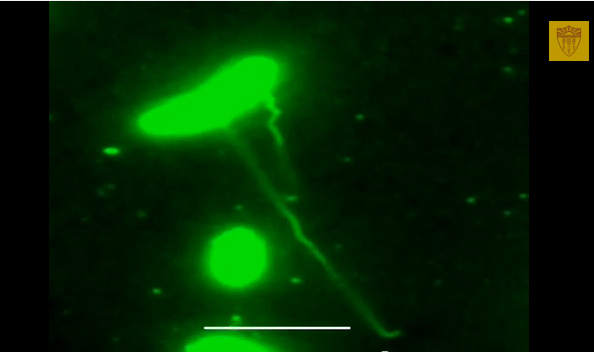 Results: Some bacteria shoot out tendrils that conduct electricity. Now, researchers have determined the structure of one variety of bacterial nanowire, and found the wires are distinct from common bacterial hairs that they closely resemble. Appearing in the Proceedings of the National Academy of Sciences, the work was led by Moh El-Naggar at the University of Southern California. Contributors included researchers from Pacific Northwest National Laboratory, Penn State, the University of Wisconsin-Milwaukee, and Renssalaer Polytechnic Institute. Why It Matters: The results will help scientists understand how bacteria build up or break down minerals, and help researchers harness the bacteria to make microbial fuel cells, batteries, or to turn waste into electricity. Methods: To determine what the nanowires are made of, researchers used genetics and molecular biology to narrow down the proteins involved. They found that rather than the expected bacterial hair proteins, the nanowires comprised specialized proteins called cytochromes that shuttle electrons. PNNL researchers helped make the cytochromes fluoresce in cells, allowing the team to show they are located in the wires. Read more at USC's Pressroom. Sponsors: The work was funded by the Air Force; the U.S. Department of Energy (DOE) Office of Basic Energy Sciences Division of Chemical Sciences, Geosciences, and Biosciences; the National Science Foundation; and DOE Office of Biological and Environmental Research. Research Team: Sahand Pirbadiana, Mohamed Y. El-Naggara, Kar Man Leung, Hye Suk Byuna, and Yamini Jangira (University of Southern California); Sarah E. Barchinger and John H. Golbeck (Penn State); Rachida A. Bouhenni and Daad A. Saffarini (University of Wisconsin, Milwaukee); Samantha B. Reed, Margaret F. Romine, and Liang Shi (PNNL); and Yuri A. Gorby (Rensselaer Polytechnic Institute).